“Ser artista implica trabajar dia y noche: no todos asumen esta responsabilidad” (To be an artist means to work day and night: but not everybody accepts this burden). It is 2005, we are in a badly refrigerated room of a Centro Habana’s apartment. Fidel Garcia (at that time he was still known with his Micro X nickname, by the name of the homonym precinct of the Alamar quarter where he still lives now) has paid me a visit to talk about his work. At that time he was an ISA student (Instituto Superior de Arte, maybe the best school of art in all Latin America) and made part of Tania Bruguera’s Catedra Arte de Conducta, the educational project the Cuban artist carried on for almost a decade, by bringing artists, philosophers, activists and curators to Cuba in order to educate and raise a new generation of artists, grown up in the shade of the international panorama of our time. Fidel was then an artist that few in his country could comprehend. 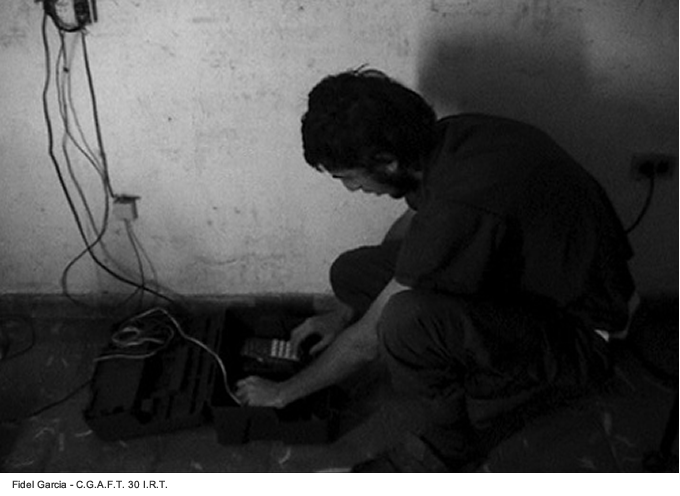 He was introduced to me by other artists: he was helping them rearranging their audiovisual documentation archive. He had spent a whole night at video editing, sitting in front of an old Mac in Tania’s studio, made available for the students of the Catedra. At that time to import computers in the island without permission was still forbidden, as well as to buy some without publicly recognized institutional reasons. A Mac was a unique good and Fidel was one of the few in town who could ever use it and produce something creative with it. After that meeting, I had known Fidel was a genius at using every kind of technology. And above all, he was also the author of strange projects. He had become a radio amateur in order to enter the T.E.P.S. 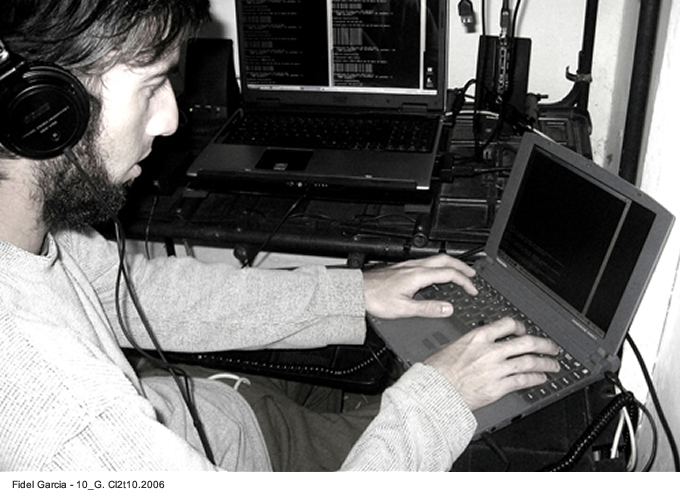 radiophonic network (Territorio Extendido por Propagaciòn de Sonido, 2004); he had raised a community of earthworms that were self reproducing by eating earth in the basement of ISA and turning into a self-sustainable system (Micro X. T3. 0, 67 m3, 2004); he had made a mysterious performance in Alamar where he was lying on his stomach, in the middle of a street in a populated quarter, sucking water from a puddle with a drinking straw (HAT 2 – Humano Activado por el Territorio, 2005). At the 2006 Havana Biennial I met him again in Tania’s Studio, during a parallel event (yet most interesting than many things you would see in museums or galleries). It was the presentation of the works of Catedra’s young artists, attended by many international curators and critics. During his presentation, Micro X defined his work beginning with an objective description of his projects, ignoring all theoretical/critical reasons that pushed him to create them. It seemed a list of complex and obscure operations through and through. Realization of a mobile radiophonic emission in the streets of his quarter; insertion in the national telephonic web; creation of prototypes capable of intercepting radio waves in the air and turning them into sound and so on. In response to these detailed descriptions, Spanish critic Jose Luis Brea had objected: “I can’t understand why you are talking about this. What’s the point?”. All the non Cuban critics nodded to that comment, for they could find neither a link nor an aesthetical reason for those operations. The Cuban critics instead, who were really fascinated by his presentation, had revolted against Brea’s comments by shouting: “in a country where everything is public, where all systems are dominated by the institutions and all communications are always under control, to act as a bug in any mechanism has a meaning much greater than anyone outside Cuba could ever imagine”. FIdel Garcia is one of the most visionary artists of Cuba’s last generations. 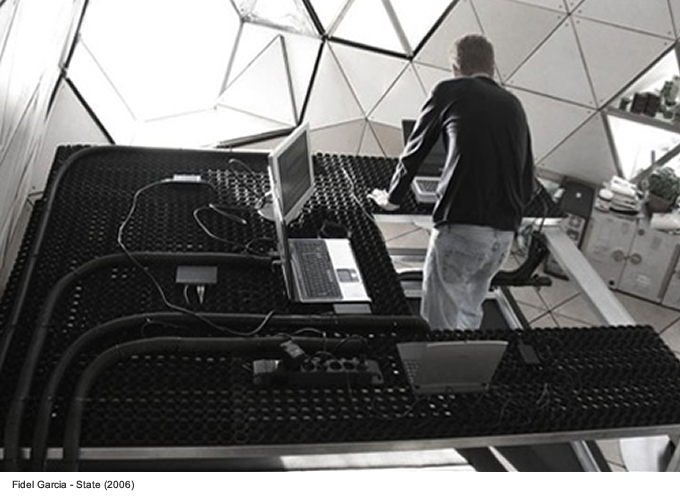 His experimentations with old and new technologies operate conceptually in public, social spaces and every kind of system. He believes art is a platform where to create public events: the public spaces of a town, a public building, the air, the telephonic networks and society in general. These events are none other than “simulation of the real”, as claimed by himself, and are deep-rooted in a systemic analysis of the specific contexts the actions are aimed to and in their deconstruction of the carrying structure. That is why Fidel Garcia speaks of himself as an activist and anthropologist. 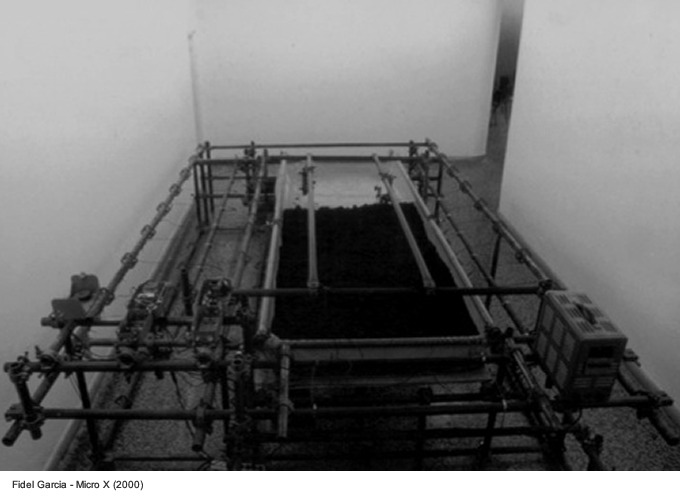 The projects he realizes are always based on observation, analysis of the context (considered by him radically as “the system”) and its structures, deconstruction of these structures in view of a direct intervention. Power and control are indeed the main core of his work, acting like a virus injected into a system. 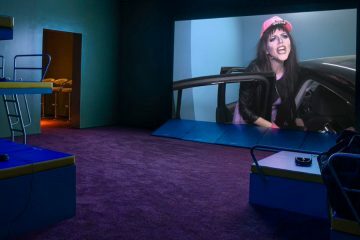 The output of his works often mixes old and new technologies, and expresses itself as the reconstruction of a new world with rules and life of its own, generated by the alteration of the normal functions of the previous system and, subsequently, by the public show of its mechanisms and bugs. Wires, sound waves, tools emitting sound, computers, motors, chemical reactions, engineering structures are pure instruments in this sense. They are tools used in order to demonstrate axioms and not functional to the construction of an aesthetical object or useful to the aestheticization of a process. “Our generation grew up by technology – says Fidel in a long interview – I don’t care about using the instruments of art. Art is now at the edge of its evolution. Working with information media connects you with the present, with what is happening now in the world. Here, indeed, it happens in a less diffused way, because of Cuba’s situation (impossibility or difficulty to access the instruments)”. In other words, the analysis of the systems unveiling structures and mechanisms becomes the base on which to build other systems that are their functioning metaphor. “I intend to create a parallel reality. My works start from codified programming systems that were born out of reality but soon they build another one during their functioning. A parallel reality. The medium then becomes an effective tool to trespass in our everyday life. My work generate “Trespassing systems”. It utilizes codes of common use that act as another language within the context of the newly born situation. And I am the only channel allowing to decode the meaning of such conveyed information”. Fidel’s projects are heavily characterized by the almost total absence of human beings. Even when they are present (as in the case of T.E.P.S. 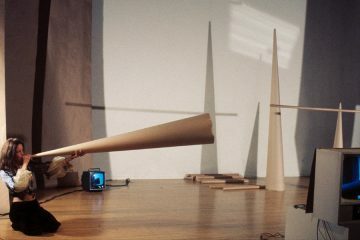 radio amateurs), they are functioning part of the system, as any other machine, computer or tool summoned by the artist. 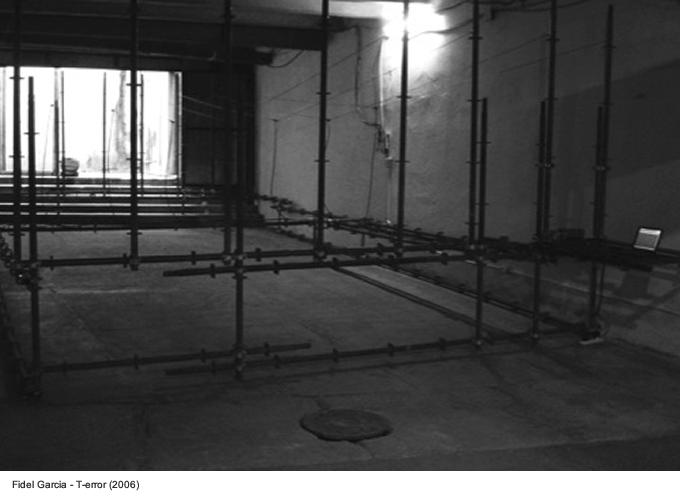 The work is meant for the public spaces but it does not count any immediate interaction with other individuals. “I work in the public spaces but not under a human point of view – Fidel continues. 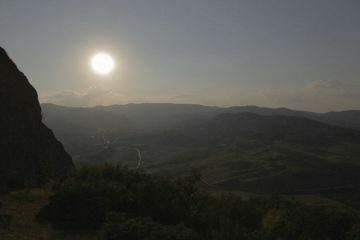 I focus on the human influence on the territory. I work in favor of the territory. I consider it an independent space. Such a nonsense if we think about our everyday reality, where the territory is pretty inert. I see human beings as a system of cells, an organization housing information. Then if I use a human being in order to make a performance I use him as a organization conveying information, not for his own body. The same applies to the territory: an information archive, a memory bank to penetrate and to work with. And I work with each memory bank of every territory, which provides me with different information. My role is then to channel information, depending on the territory I am operating in. Each work brings different information depending on the territory they were conceived”. Fidel’s work grew during the years. He has lived in Denmark, at the Rijksacademie in Amsterdam and has become professor at ISA, the same school where he grew up artistically and still many Cuban artists of the previous generations teach. Among them, René Francisco, who made a creative process out of his educational practice with his Pragmatics, collective groups of artistic production where the professor disappears and becomes part of the collectivity. ISA is one of its kind. Art students from all around the world come here only after a difficult test and improve their artistic practice on a creative and theoretical base. 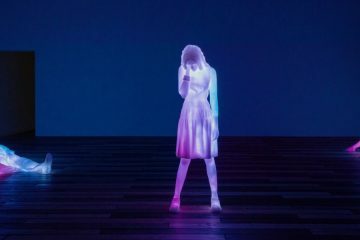 The students’ works are not classified by discipline, genre or used media, but first of all by a clearly theoretical and conceptually complex context. The artist’s education in this context has no doubt influenced his practice, founded on a conceptual complexity he showed in the work with every means necessary. 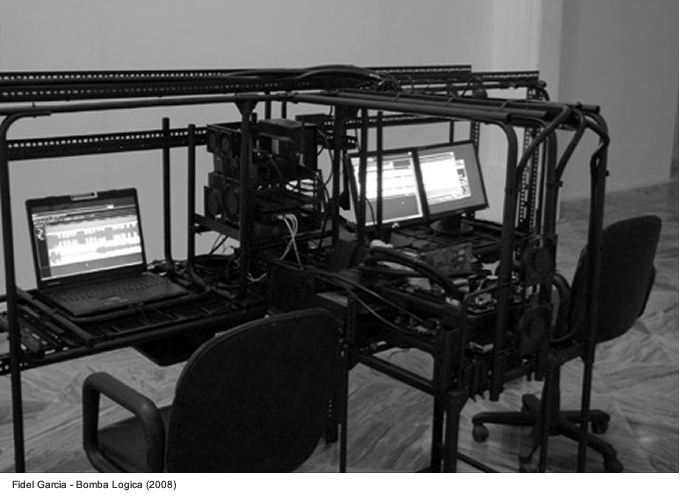 One of his works, 28 % / Software 28 % of 2008, has been defined as a “cybernetic tool with the power to alter the ideological system”. It shows how ideologies work in (social) systems and decode them as prescindible, not obligated procedures one can always find a way out. The icon through which this analysis develop is lobotomy, “neurosurgical therapy invented for treating individuals whose behaviors are beyond control”. 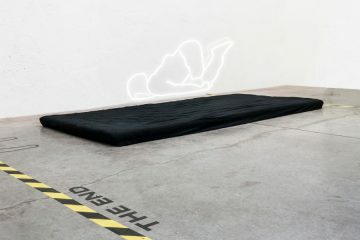 The installation utilizes the concept of lobotomy as the metaphor of information deleting in a complex system: an installed software deletes 28% of the information contained in a computer. “I see ideology as a mental conditioning, a law enacted by a mechanism of control based on striking fear for other ideological alternatives” Fidel concludes about this work. 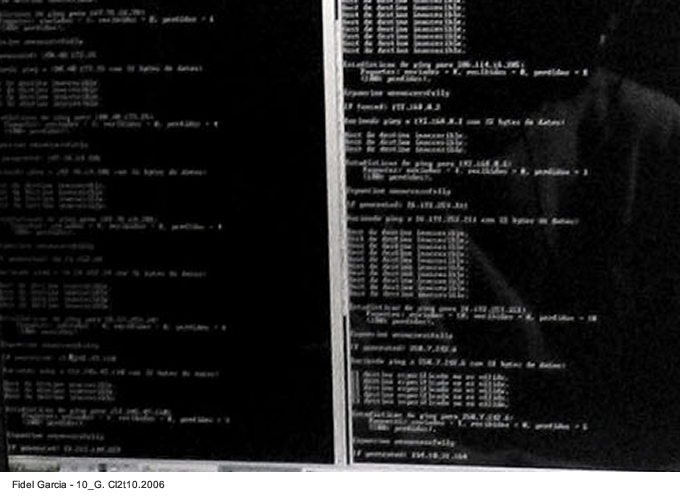 STATE (2006) instead consists in the creation of an information virus by the same name. The virus has four features, metaphors of what Fidel calls “real state”: capability to export, capability to import, capability to accumulate and capability of change or mutate. The software bases its functioning on learning from its mistakes. For example, it identifies needs, dependences and subordinations of the system it is installed to. STATE starts from a newly acquired intelligence: it evolves, develops, learns and once entering a computer it installs its four functions, taking possession of the contents of the host. Therefore, art is for Fidel a platform of symbolic systems, images of social reality.